My lack of posts this week has been a result of lack of mojo. I've created a couple of cards that have ended up in the garbage or are still sitting here unfinished because I don't know what to do to make them look "right". Hopefully, this weekend my mojo will return and I'll have something suitable to show! Lucky for me, my blogging friend Laura Fredrickson, Scrapnextras, mailed this gorgeous RAK (Random Act of Kindness) to me and I'm able to use it for "blog post material"! Laura and I were conversing via e-mail a couple of weeks ago, pumping each other up about the other's amazing talents when we finally decided to call a truce as honorary members of the Mutual Admiration Society! LOL! Poor Laura got an earful from me that night after a really crappy day. Not only did she send cyber hugs but followed up with the folded kind! Isn't she awesome?! Her designs and talent continually blow me away! I just love it when her blog, Scrapnextras shows a new post on my Google Reader! .... it is ALWAYS a pleasant, unexpected surprise when I visit! Oh, I'm glad it finally made it to you! I confess it was a week before I made it to the post office LOL! But I did address it that night! I am with you on the Mojo thing girlfriend. I had to do something for our Loonie Stampers and I did it three times. I am still not happy with the finished project but had to have it posted at 6:00 am this morning! you better get your mojo back, girlfriend, or I am going into withdrawal, he!he!! Now, I get what Mary was referring to this morning when she talked about the Mutual Admiration Society in the e-mail she sent me! Lol! I hope you get your groove back soon! That is a GORGEOUS RAK from Laura! I totally agree she is a sweetheart too!! Sorry you've had a rough week...hope now that the weekend is here you can sit back and relax. I'm sure you'll be back into the swing of things in no time and have a FABULOUS piece of art to share!!! Beautiful card from Laura, I agree she is super talented, as are you. I continually "stalk" both blogs to find inspiration. I am sure that you will be back in the swing of things very soon! Sorry to hear that you have had a rough week. Can't wait to see what you create next, I think you should post the ones from the garbage, I am sure they were great!!! I really like the Mutual Admiration Society...too cute!! Nancy, that's a beautiful card from Laura!! I would find it very hard to believe you wouldn't have any mojo!! You are both very admirable ladies!! 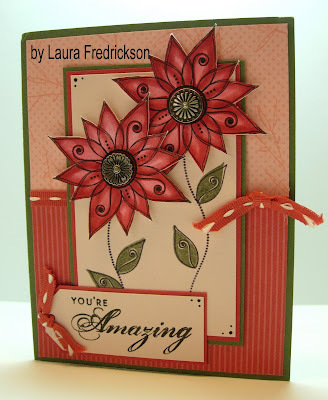 what a beautiful card Laura made...I know I belong to the Laura and Nancy Admiration Society too! You & Laura do make a GREAT team!! Laura's card says it all! "YOU ARE AMAZING!" This is such a beautiful card! Sorry to hear that you had a bad week, hope thing look up! Gorgeous RAK! I bet your mojo will return soon. What's landing in your garbage most of us would probably be proud to call our own! For someone who lost their "mojo", you're doing very well with this card. I love the colour combinations. Very nice!